A bullied outsider is given a new lease of life when accepted to drama school. 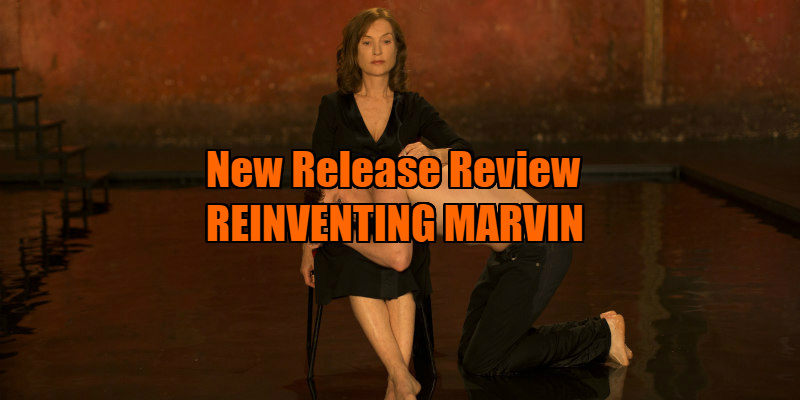 Reinventing Marvin doesn’t reinvent movies, but that’s fine when a string of appealing performances keeps our interest mostly afloat in a sea of clichés and a challenging running time. Nocturama star Finnegan Oldfield and child debutante Jules Porier portray the titular character. Marvin runs the entire gauntlet of victimhood within the first 10 minutes of the film; he’s bullied at school, doesn’t have any friends like the group of girls on the bus who sing acapella French songs together, and has a dysfunctional family life. The gay lad subconsciously escapes from the conservative reality of his town by fantasising about making love to one of the attractive guys who bullies him. Later, he finds a tangible way out through a love of theatre and a subsequent acceptance into drama school. The reinvented adult Marvin is an aspiring professional actor who prepares for his big moment in life - a stage play in which he relays his life story and struggles growing up. Oldfield deftly performs a series of monologues which blur the line of his performance as Marvin the actor and Marvin the man. These monologues chronicle the interactions between Marvin and the hostile forces around him, particularly his unpleasant family members. His introspective playwriting feels like a build-up to a climactic childhood moment, but that moment never really arrives. Porier is a commanding presence, recognised by Fontaine, who chooses to shoot him in close-up for a considerable duration of her film. He looks far into time and space when he daydreams, like a character straight out of a Terrence Malick movie, and we can make educated guesses at the sentences he wants to say out loud (but can’t), due to the expressiveness in the young actor’s face. Things start to get bland when the character development takes its time, but a welcome cameo from Isabelle Huppert as herself adds some spice. The legendary performer instills some confidence in the protagonist and participates in a much larger plot point in the third act. Oldfield holds his own against her in the scenes they share together, and when the fictionalised Huppert praises Marvin’s abilities, there’s a meta layer in the Oscar nominee cosigning the gifts of France’s potential next big star. Much of the value in the film is in the performances, for the themes of growing up poor, gay in an unaccepting town, being bullied, etc. have been much better explored in countless other coming-of-age flicks. There’s a very small minority of audiences who won’t know what to expect of this narrative, which doesn’t stray from the inspirational turnaround arc for its hero. That minority will likely include youths who are around the enfant Marvin’s age, who may not have seen so many movies and thus this cinematic experience can serve as ideal escapism for them if they feel the same way. That is, if they don’t get restless during the running time of 110 minutes, which is far too lengthy for a simple character study. Despite the disappointingly unoriginal perspective, the actors’ strong success in creating the central character is just enough to recommend Reinventing Marvin. Reinventing Marvin is in UK cinemas September 14th.